The Global Group Work Project is pleased to support upcoming conferences and events that will help to advance our international group work practice. Take a moment to check out some of these that are taking place. 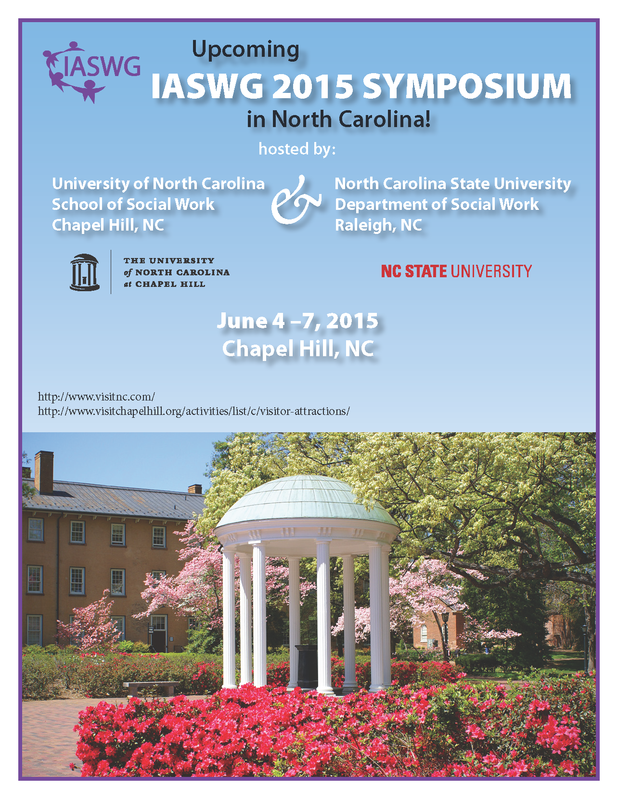 XXXVII ANNUAL SYMPOSIUM OF THE INTERNATIONAL ASSOCIATION FOR SOCIAL WORK WITH GROUPS (IASWG), June 4-7, Chapel Hill, NC. Please join the IASWG in Chapel Hill, North Carolina June 4 – 7, for the 37th Annual Symposium hosted by the Faculty of Social Work at the University of North Carolina, Chapel Hill. We welcome students, faculty, agency administrators, practitioners of various disciplines, and community developers who utilize the group modality to submit papers, workshops, posters, and other innovative presentation formats. Click here for more information on Call for Papers. Please join the IASWG in Calgary, Alberta, Canada, June 5 – 8, 2014, at the XXXVI Annual Symposium of the International Association for Social Work with Groups hosted by the Faculty of Social Work at the University of Calgary. We welcome students, faculty, agency administrators, practitioners of various disciplines, and community developers who utilize the group modality to submit papers, workshops, posters, and other innovative presentation formats. This extraordinary, biennial conference (sponsored by the IASSW, IFSW and ICSD) provides an opportunity to join together with social work and social development practitioners, educators and students from around the world. It can be a powerful venue for building groupwork investment and knowledge. Let’s connect in preparation, and insure that groupwork and its contributions are present. We will try to schedule another Special Interest Session in Melbourne, as well as try to set up a few group-focused panels. We can also circulate info on presentations through this site and email lists – Let us know what you would like to post. You can share ideas and comments at www.globalgroupworkproject.com or email cohen5@adelphi.edu. • How do we develop the relationship between academic research and teaching, and workplace learning and practice? • How do we manage the transition from study to employment? • A time of great organisational change in health and social care? June 6-9th, 2013 – Simmons College in Boston, MA. For information about the event and registration, please click here. Here is the Group Work Track Description: This Track discusses innovative ideas in social work with groups, with applications in teaching, practice and/or research. This Track particularly seeks to discuss new theoretical models, empirical grounding (qualitative and quantitative), and social work programmatic and practice approaches that explores the unique qualities of group work in meeting the needs of oppressed and vulnerable populations in a global context. Please feel free to circulate this information through your networks, and feel free to contact Alex Gitterman (alex.gitterman@uconn.edu) and Carol S. Cohen (cohen5@adelphi.edu), Group Work Track Co-Chairs, with any questions about submitting abstracts. Thank you very much for your ongoing support for group work education and practice. Adelphi University, Garden City, NY.